Russafeld, also known as Rosefield or Rosfeld, is a small town in central Summerset Isle, over a plateau named Russafeld Heights west of Shimmerene and south of Cloudrest. Russafeld grew around the Red Temple, which is an ancient Aldmeri shrine to consecrated to Y'ffre, built, most probably during the Merethic or early First Era. Russafeld means "scarlet shrine" in some dialects of Aldmeris, which may explain where the Red Temple gets its curious name. But the most commonly held opinion states that it's a shortening or corruption of "Dread Temple." Caanerin, the indrik matriarch, had attacked Russafeld more than once. Prior to the mid-Second Era, she fawned a whole herd of lesser indrik and destroyed half of Russafeld. Ancient indriks like Caanerin enjoy a deep connection to Y'ffre. It is unknown her connection to the Red Temple and the status of Russafeld as a holy place of worship to the Green. After that, the Sapiarchs erected warding stones to keep her from returning. However, she returned to her ancestral glade near the center of Summerset Isle around 2E 583. Divine Prosecution's hirelings killed her and restored the magical protections, saving Russafeld. During the brief period during the mid-Second Era when Queen Ayrenn's decree legalized migration to Summerset Isle, many Bosmer moved from their homeland in Valenwood to work on the fields of Russafeld. However, Wood Elf manpower presence was not unheard of before that time, when the Ghost of the Green first struck in Summerset due to Bosmer sentiment of exploitation by their Altmer overlords. The town was still in existence during the Tiber Wars, where it became known as Rosfeld. During the Imperial Simulacrum, it was known as Rosefield and was ruled by Lord Lillandlas. It had a rivalry with Holly Falls. It was neighbored by several settlements, including Riverfield in the west, and Shimmerene in the east. Russafeld has been an integral part of the realm of the Summerset Isles since its foundation by the Alinor Monarchs. Neither a canonreeve or a kinlord is known to be tasked to rule the settlement and its rich hinterland, but a simple bailiff. 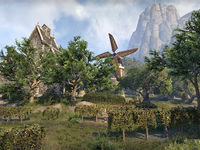 This settlement is known as the birthplace of wine in the Summerset Isles. Its vineyards span nearly the entire stretch of land between Rellenthil and Shimmerene. Russafeld reds are the most appreciated alcoholic beverage by the Altmer. It is also a very popular touristic spot and retirement resort for the elite. This page was last modified on 22 March 2019, at 13:33.